CRISPR-Cas9 which gained much popularity in editing system of DNA, researchers have applied the same technique for the first time on RNA. University of California, San Diego researchers published the result on March 17, 2016 in the journal Cell. The genetic code stored in DNA determines all the bodily mechanisms from colour to susceptibility towards any disease. But this is always not the case which determines the diseases linked to, but does some of them which are linked to RNA. It is the intermediary genetic material that carries the genetic code to knit amino acids to form protein. Figuring out the location of RNA to be targeted is primarily important for the researchers to go forward. 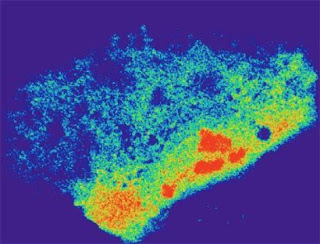 Identifying the location would determine whether proteins are produced at perfect location in appropriate time. This is when scientists brought forward to use CRISPR-Cas9 system, a naturally occurring editing tool for DNA in Bacteria. CRISPR-Cas9 normally works with a designed RNA targeted against the sequence of DNA to be edited, and the Cas9 enzyme able to degrade the target after proper complementary binding of RNA. The final repair can easily be recovered by the host itself. This whole system until now was limited to DNA, but Yeo and his colleagues at University of California, Berkeley used the same for targeting RNA in live cells, called RNA-targeted Cas9 (RCas9). In order to modify the target from DNA to RNA, they have changed several features in CRISPR-Cas9 system. An associated short designed nucleic acid sequence called PAMmer, along with guide RNA can guide Cas9 to RNA molecule. Excerpt: "It [RNA] is the intermediary genetic material that carries the genetic code to knit amino acids to form protein." My comment: Nutrient energy-dependent RNA-mediated amino acid substitutions link hydrogen-atom transfer in DNA base pairs in solution to the creation of proteins. Adhesion proteins and other proteins create functional structures. The energy-dependent de novo creation of functional structures links nutrient-dependent microRNAs, microRNA flanking sequences, and RNA-mediated amino acid substitutions to the physiology of reproduction via what is known about supercoiled DNA. Supercoiled DNA protects the organized genomes of all living genera from virus-driven entropy. It links the anti-entropic energy of the sun from physics and chemistry to biologically-based cause and effect via everything known to serious scientists about the conserved molecular mechanisms that link angstroms to ecosystems and all biomass and all biodiversity. For comparison, neo-Darwinian theorists might still claim that mutation-driven evolution links ecological variation to ecological adaptation and all biodiversity. Many of them probably never learned anything about cell type differentiation. It may be too late for them, but it is not too late for everyone else to attack the misrepresentations of all theorists and learn how to link top-down causation from the sun to all biophysically-constrained biodiversity, without use of the term de novo. Thank you for the wonderful addition and magnifying your views. For a recent example of ridiculous term use, see "de novo" in the sentence below. Excerpt: "Another noteworthy example of a small RNA-coding gene implicated in human brain evolution is a microRNA mir941 that emerged de novo in the human lineage a few millions years ago and played a role in reorganising gene regulatory networks controlling cellular differentiation and neurotransmitter signalling ." Ryszard Maleszka places energy-dependent RNA-mediated cell type differentiation into the the context of emergence and millions of years of evolution via use of the term de novo. That is the magic of evolution. It's like a word game that is played by those who define their terms, redefine them, or fail to define them when they have no knowledge of how energy-dependent RNA-mediated events are linked to the de novo creation of different genes via amino acid substitutions.